Costa Rica, with its long, dramatic coastline, misty cloud and rain forests, smoldering volcanoes and pristine golden beaches, is one of the planet’s most biologically diverse countries. Named the “rich coast” by the Spanish conquistadors who first settled here, Costa Rica is a place for the adventure of a lifetime. With 5 percent of the world’s biodiversity concentrated in such a small area, it allows for close encounters with a myriad of animals, among them several spieces of monkeys, frogs, birds and sloths. This is the land of adventure with picturesque rain forest and cloud forest hikes, sailing on aquamarine ocean to secluded coves, ziplining, floating on primeval rivers through mangrove forests, enjoying the volcano formed thermal pools and relaxing at the world-class spas, or listening to the chattering of howler monkeys and toucans just outside your window. With a history dating back to the 1500s, today Costa Rica is often referred to as the “happiest place on earth.” Ticos, as native Costa Ricans are called, live by their motto Pura Vida, meaning anything from “Hello” to “This is the Life!”, and the Costa Rica's Nature Paradise tour will allow us to take advantage of this happy lifestyle and spend the 10 days living to the fullest! 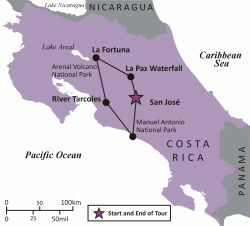 We’ll spend the first night in Costa Rica's capital of San Jose, before moving for four nights to the La Fortuna region, in the shadow of the smoldering Arenal Volcano. We'll spend the next three nights in the Manuel Antonio National Park region on the dramatic Pacific coast, before coming back to San Jose for one more day to explore the city. While in the La Fortuna region, we'll see the Poas Volcano and La Paz Waterfall, learn about the ancient secrets of chocolate during a cocoa farm tour, enjoy a Costa Rican cooking class and an interactive coffee plantation tour, relax in the mineral hot springs, walk in the canopy of the rain forest on hanging bridges, soar above the mountains, as we take the Sky Tram to the Arenal Volcano overlook, where we can try ziplining, then relax as we watch the wildlife during the Twilight Safari Float. While in the Manuel Antonio area, we will spend time in the famous Manuel Antonio National Park, visiting with a private guide to learn about the exotic plant and animal life and about Costa Rica’s native history, take a boat tour in a river filled with crocodiles, have lunch in a converted cargo plane, we'll sail on a private boat into the sunset, as we admire the dramatic coastline, stop to snorkel and celebrate this amazing adventure with a farewell dinner while enjoying the glow of the Costa Rican sun. There will also be time for spa and leisure time on the beautiful Manuel Antonio beaches. While in San Jose, we'll see the city's highlights with a private guide, during a panoramic city tour. Additional/optional costs may include: optional travel insurance, optional single room supplement, additional accommodations, optional early hotel check in, optional tour director's gratuities, meals or activities not mentioned in the itinerary, room service, mini bar charges, laundry charges, phone calls, personal expenses. The cost does not include airfare.